Dear Pet Rescuers, Candy Crush Saga has conquered the gaming sector with its unique merging of simple mechanic of swapping, competitiveness, colours and enjoyment. 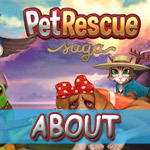 Now, a new trend by King.com (also the makers of Farm Heroes and Bubble Witch) has managed to bedazzle every game enthusiast worldwide: Pet Rescue Saga! And it may be only a couple of months old, but a whole series of walkthroughs, cheats, strategies, tips and tutorials have already been brewed to guide you safely through the tricky levels. So, join us on our Facebook Page, follow us on Twitter or subscribe to our RSS Feed to get the latest news and tips on the new Saga craziness! 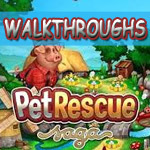 One of the most important features of petrescueguru.com is our complete list of walkthroughs for each and every Level! What most of our visitors misunderstand has to do with the fact that these videos aren’t supposed to be memorized while every game is different from the previous or the next! Instead, you have to watch carefully the walkthrough videos, elaborate the tactic we follow and this will definitely help you pass each level! In order to help you even more we also share some of our tips/strategies under the videos! Pet Rescue Saga, the freshest launch from King.com, has come to push the gigantic success of Candy Crush Saga a huge step forward. Bearing strong resemblance to the latter in terms of the matching-similar-blocks mechanics, it has already rendered tons of fan to avid gamers that are in the hunt for something new! 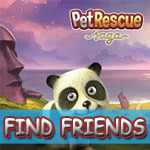 This is our page for people who are playing Pet Rescue Saga and are in desperate need for more friends! We absolutely feel how important its for you to increase the number of your Pet Rescue Friends in order to get more lives which is necessary to pass the levels! By requesting other pet rescuers to add you in their friends’ lists you actually grab the advantage of receiving lives/tickets almost the moment you need them! So what are you waiting for? 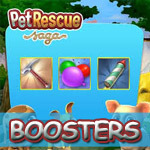 Pet Rescue Saga is an intriguing action puzzle game which, in many occasions, poses tricky riddles even to avid gamers – and that’s exactly where a handful of Boosters (starting from level 6) come to render invaluable assistance, from wiping out single stone blocks to eradicating whole rows! To get those Boosters, you need to use Gold Bars – except for the Block Buster Booster, which is picked up with in-game acquired coins. 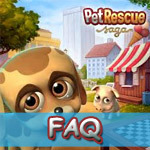 Let’s have a look at common questions about Pet Rescue Saga. 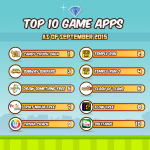 They are divided in categories, such as Game related Faqs, Device related questions and Facebook related faqs. Feel free to make your own question and it would be answered by our team as soon as possible.